With spring coming on, we all enjoy spending our time outdoors (when it isn’t raining). To bring the outdoors in your apartment all year long, you can add potted plants and trees to make your home a retreat year round. Choose plants and flowers that thrive well with minimal light and a limited amount of care, like a peace lily, African violet or a Boston fern. You’ll want to make sure that you keep a certain amount of natural light in your apartment to make sure your plants stay healthy and vibrant. In addition to plants, you can add herbs to your potted plants to keep your kitchen stocked with fresh flavors without the added cost at the market! Though the weather is improving, it still hasn’t hit patio season weather. If you want to get out and spent a little time exploring, it is the last weekend of the Twin Cities Auto Show. Whether you want to drool over the gorgeous cars or have some family fun, it is great for both! Get more information on the official website! Fresh herbs give a delicious boost to home-cooked meals, but shop-bought herbs can be expensive and tend not to last long. However, if you love herbs, but your budget is tight, there is good news–you can grow them yourself, indoors or outside. It doesn’t cost much, takes up very little space, and makes few demands on your time. Furthermore, you’ll enjoy a ready supply of your favorite flavors and a wider variety of fresh herbs than many supermarkets offer. Dill, parsley, basil, chives, sage, oregano, rosemary, thyme, and mint, among many others, can be grown outdoors in containers. Start these culinary herbs from seed or buy inexpensive young plants from a garden center. If you do decide to grow from seed, start your plants inside in spring using a seed potting compost before planting them out in a potting mix. Feed your herbs with seaweed plant food and water frequently. Many herbs like sun, but if you have a shaded garden, don’t worry–one of the benefits of growing herbs in tubs, pots, or hanging baskets is that you can move these containers around to take full advantage of the sunniest spots in your outdoor space. If you live in an apartment, make use of a window box. The herbs already mentioned can be grown inside too, with parsley, dill, and basil being among the easiest to grow. Sow seeds in good seed compost in pots with drainage holes. They will germinate quickly (sometimes parsley takes a couple of weeks) and your herbs will be ready to harvest after a few weeks on a sunny windowsill. You can maintain your supplies throughout the year by sowing more seeds at intervals. Feed your plants every couple of weeks with seaweed extract and water as required. Be careful when watering–herbs don’t like to sit in overly wet growing medium. Take every opportunity to use your herbs. Harvesting them will encourage new growth and keep your plants healthy. Unless you want to collect seeds, snip developing flowers off your herbs so that the leaves stay lush. If you find yourself with a glut of herbs, there are a variety of ways to preserve them for future use. You can dry them, freeze them, or use them to make herb jellies, oils, and vinegars. Growing herbs is a very pleasurable pastime. 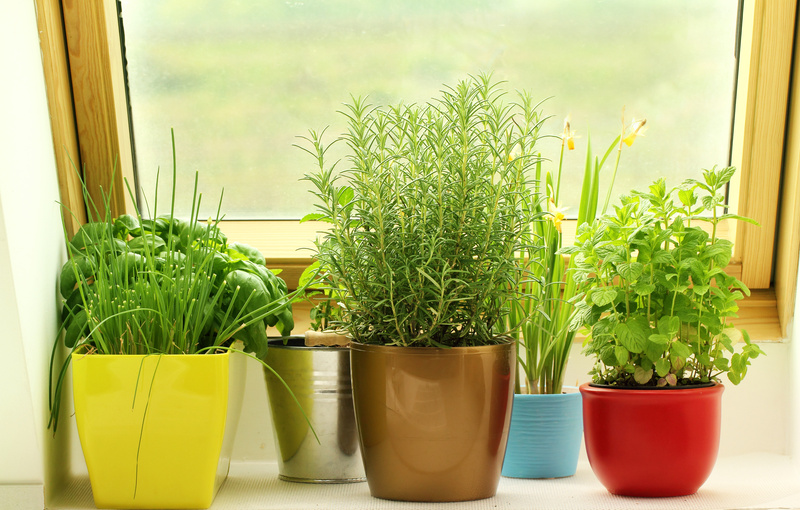 Once you’ve invested in a few pots, compost, seeds, or young plants, growing your own is an inexpensive way to provide a plentiful supply of aromatic plants for your kitchen. Parsley, dill, and basil will need to be replaced or sown afresh each year, but thyme, chives, sage, oregano, rosemary, mint, and other perennials will keep on giving for years. So, if you want to pep up your cooking with fresh herbs don’t want the added expense on your grocery bill, why not grow your own?